You spoke up about wanting even more family entertainment tips and I listened! I’m tickled to help you create a cozy family movie night in your home that memories are made of. Maybe you want to create it once a year, once a month, or every Friday night! I think you’ll be amazed at how simple it can be in three simple steps to create an unforgettable experience for your people. No matter how simple you make it, OR how Pinterest-y you want to get, there are only three main components to any fabulous family movie night. Are you ready for the secrets? Here goes: you must have great movie snacks, a cozy space, and an incredible movie choice that will keep everyone’s attention. Easy peasy! If you want to get fancy from there, then go for it! Movie snacks are king, so choose a variety that your people can choose from. Keep it simple: they need to be filling, salty, and sweet. If everyone is hungry, serve pizza. Be sure to have a little popcorn and sweets on hand as well. Don’t have chocolate and don’t want to go to the store? Whip up some 5 minute fudge! Friends of ours got us hooked on eating popcorn with M&M’s poured over the top. The popcorn is just warm enough to melt the chocolate enough to be yummy but without melting and making a mess. You can go as simple as gathering around a couch or bed and turning all the lights out. Make things extra special by sending everyone out of the movie room and create a cozy space like a blanket fort around chairs, the couch, or the bed. Here’s a simple tutorial on how to make a blanket fort. You will blow their socks off if you can swing that one. So far at THTG, we’ve talked about cool movies, clean family movies, and family shows. Between those three lists, you should be able to pick some great family movies for your family movie night. I love the challenge of researching and reviewing good movies to watch with family. I’ll be sharing my movie reviews of new and old goodies in the coming weeks so subscribe so you don’t miss it! bucket o’ treatsThat’s it – DON’T OVERCOMPLICATE THIS! JUST DO IT! Now let’s go create some memories with that family. What did I miss? I’d love for you to share your ideas with us about how YOU have a fabulous family movie night in the comments! You are so smart! What neat ideas for making movie night awesome!! Why didn’t I think of that? I never thought to make movie night extra special with a blanket fort, invitations, or a treat buffet! Excellent–and simple–ideas! My sil bought my kids movie buckets, they love eating a snack out of it when we watch a movie! makes it special. We like to rent movies from our library. Sounds great, Harmony. My kids still remember when I would bribe them each Friday afternoon (after receiving good grades and conduct at school all week) with a trip to the local movie house to buy buckets with micro popcorn, candy, soda, and a movie. Good memories! 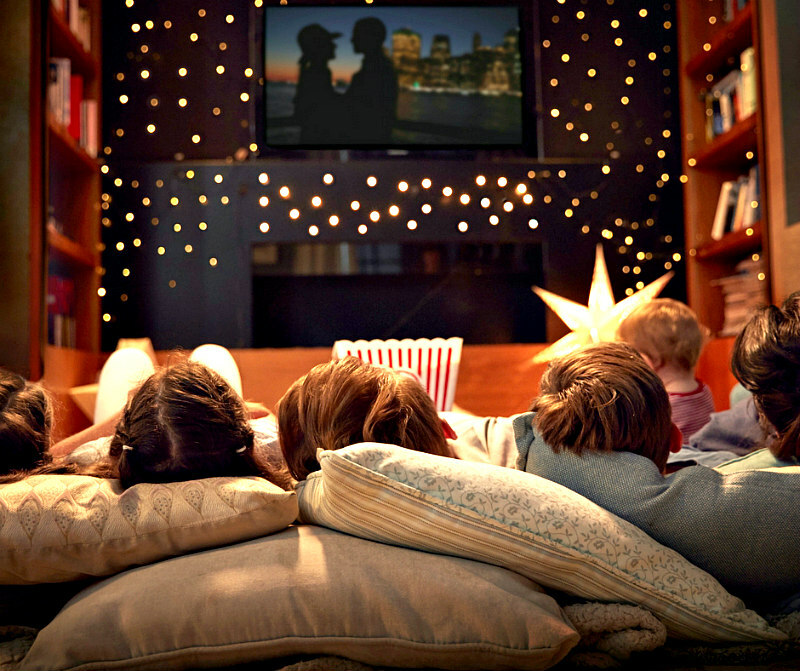 Movie nights are a favorite in our house too….a great way to bring the family together. Snacks! I love getting to hang out with my family with yummy food, comfy clothes and a great movie. 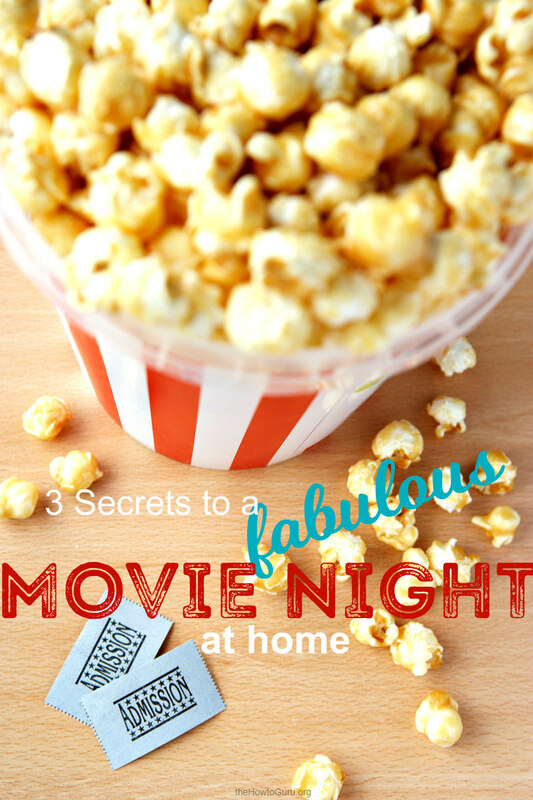 These are such great tips to make a movie night special! I will have to try these with my hubby. We are trying to budget, so a movie night at home would be a fun date. I lovelovelove the idea of pouring M&Ms on my popcorn! Your movie nights sound so cozy and special! It’s so good, Erica. Your movie nights can be the same! I feel like our family is years behind in all this fun! My oldest (10 years old) is very sensitive to movies, so he can only watch very simple cartoons or documentaries about science. Anything that has any emotion or excitement building up scares him. He can’t sleep well at night if he watches them. But maybe we could do documentary nights. And he also does not like popcorn, what planet has this kid come from! I still love him to the moon! Movie nights are part of my love language! We have the whirly pop and very rarely make microwave popcorn now. They are also still some of my fondest memories of childhood; moms stove topped popcorn all cuddled up on the big quilt on the floor! You are SO fun, Mel! The same for me on the memories – we had this huge green, Tupperware bowl that my Dad would fill up for us to watch Disney Sunday Night Movies. Love it!